Independent testing lab AV-Comparatives is the consumer’s best friend. It regularly evaluates leading brand cybersecurity products to report truthfully on the claims they make, and whether or not they deliver. Then, at the end of the year, it issues an annual report summarizing the year’s learnings. That report has just been released, and we’re proud to announce that AVG AntiVirus Free earned one of the coveted “Top Rated Product” awards. AV-Comparatives conducts their tests under realistic internet conditions, using recent malware samples. To score well, the software must provide swift and effective protection without producing too many false alarms, and without relying on the user to decide if a file is harmful or not. We have earned accolades in this arena because our software offers solid protection with a fully loaded AI-based security network. 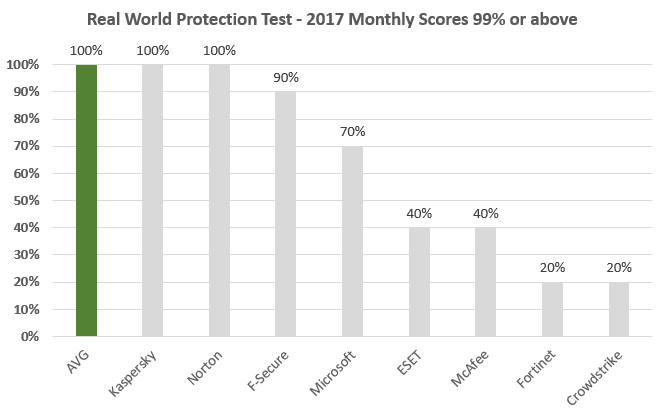 In fact, AVG AntiVirus Free scored 99% or above in each of AV-Comparison’s monthly real-world protection tests throughout the year. This consistency is key to providing our users with a reliable antivirus solution. “AVG AntiVirus Free is simple to install, and makes important features easy to find,” reports the study. For more, read the full AV-Comparatives Summary Report 2017. And to protect your system with our award-winning software, download AVG AntiVirus Free today.